Are you on antidepressants when the real problem is your thyroid gland? One of the symptoms of hypothyroidism can be depression, and many patients that come to me on antidepressants really need treatment for thyroid problems. So why is this often missed by doctors when they order laboratory testing? The truth is that these people are often suffering from borderline thyroid function (sometimes called subclinical hypothyroidism). When blood tests are run on these patients, they may come back “within normal limits” for thyroid function. Results may show that they are in the low range of “normal” free T3 and free T4 and their TSH is greater than 2. At this point, a doctor may rule out thyroid problems and recommend antidepressants. But what about the symptoms? While laboratory testing is very important, I believe it’s critical to look at both the symptoms and the lab results when seeking a diagnosis. I have many patients who come to me with low thyroid symptoms such as depression, abnormal weight gain, cold hands and feet, and dry skin, nails, and hair. Many of them are on good meal plans and exercise regularly. When they voiced their concerns to their doctors, they may have been tested and told that their thyroid function was normal and therefore they didn’t need any thyroid medications. In my own clinical experience, I’ve seen that those with symptoms and borderline test results often benefit greatly from treatment with a low dose of thyroid medication. In the book The Hormone Cure by Sara Gottfried, M.D., Dr. Gottfried points out that “…data show that more than 10 percent of the U.S. has undiagnosed thyroid problems, and that figure may be as high as 65 percent in people aged forty-nine and older” (p. 235). She also notes that “15 to 20 percent of people with depression are low in thyroid hormones…In imaging studies, the hypothyroid brain looks remarkably like the depressed brain…” (p. 232). Dr. Gottfried, along with a growing number of physicians, advocates for diagnosis of low thyroid function using “the best of both worlds combined: thyroid symptoms are carefully considered with objective blood testing using the latest scientific guidelines” (p. 233). I must say that it was gratifying to me to see that the research of this Harvard University Medical School graduate, board-certified gynecologist, and clinical researcher confirmed what I see day-in and day-out in my office! The good news is that borderline thyroid function can often be corrected. One of the major causes of hypothyroidism is chronic stress. Stress affects the nervous system, and the nervous system affects the glands, often causing hormonal imbalances. By first treating the symptoms with low doses of thyroid medications and then learning to make the lifestyle changes necessary to curb stress, people can often reduce or even eliminate medications as their symptoms subside. 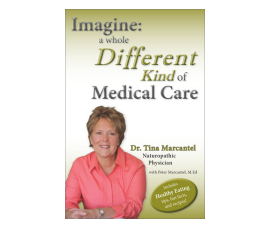 You can learn much more about hypothyroidism and its causes and treatments in Dr. Marcantel’s book Imagine: a whole Different Kind of Medical Care, available in paperback and eBook formats through our online store, Amazon.com, and BarnesandNoble.com.